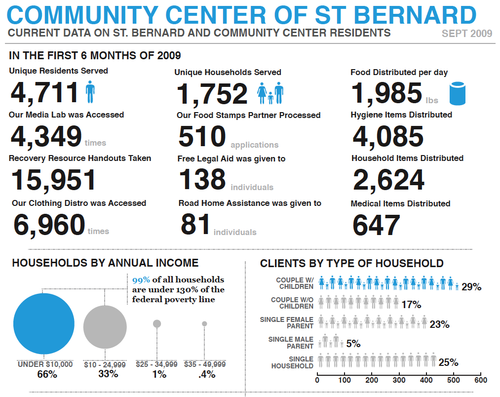 I am blown away by the data visualizations created by VISTA Billy Brown serving at the Community Center of St. Bernard. The image above is part of a data report that his supervisor found so compelling she took it to a funder. This great visualization of access and usage was created by VISTA member Billy Brown for the Community Center of St. Bernard. This Social Media Report shows the results of a survey given to members visiting the Community Center of Saint Bernard. It is useful in providing this information in a meaningful and engaging format.